Spin the wheel, pick a dress! Tis the season! No, not that one, the hot one. 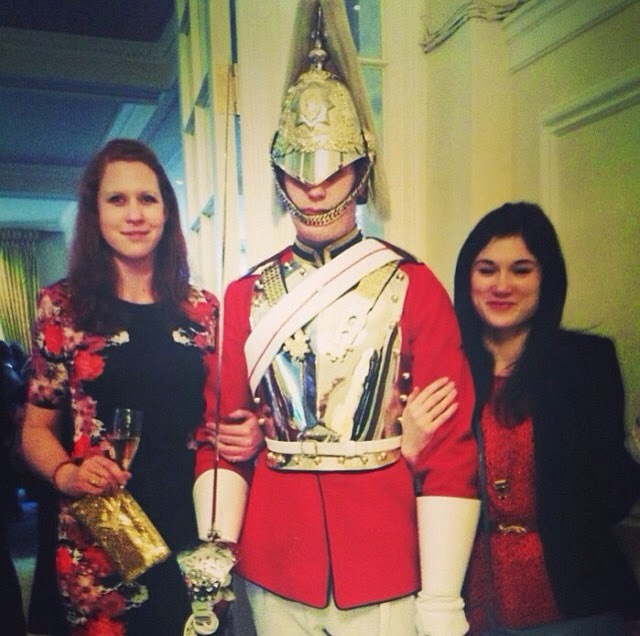 With the Pimms and the champers and the gift lists, and the midweek hangovers - yes, that one! Hurray for summer. If you've hoiked your summer wardrobe out, looked at it, and felt less than excited, this is the TGT for you. Extreme frockage to take you from wedding to party to dinner to work if you feel the desire to get massively dressed up. I've also included some sale items, and some which are only left in certain styles if they are particularly brilliant for a last minute treat. Liberally sprinkle with your favourite jewels, coats, hats and shoes. I have an exceptionally stylish colleague at work who looks the bee's knees in a jumpsuit. "Just sling a blazer over it and you'll all set," she told me last year. I failed to find a jumpsuit, but did find a blazer, so had a happy wedding indeed. (I wore something under the blazer. Just to be clear). This pink bandeau number is £60 from Topshop Tall. Sling on a belt, a necklace and a jacket and you're good to go. Wow. And again, wow. Oh and it's jersey? Crease-free wows. 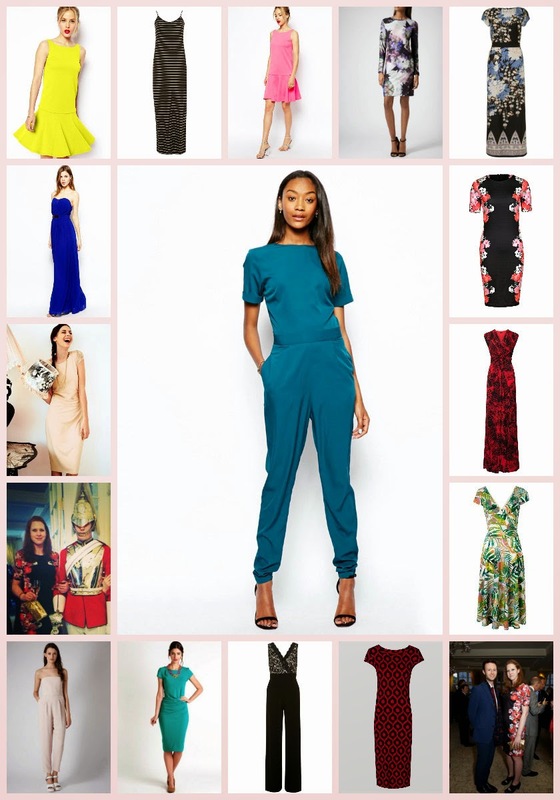 This beautiful blue jumpsuit is a winner (and £50) from ASOS Tall. I keep forgetting about Dotty P's tall range, mostly because it's not in store (rage, rage, rage - see also NEXT). 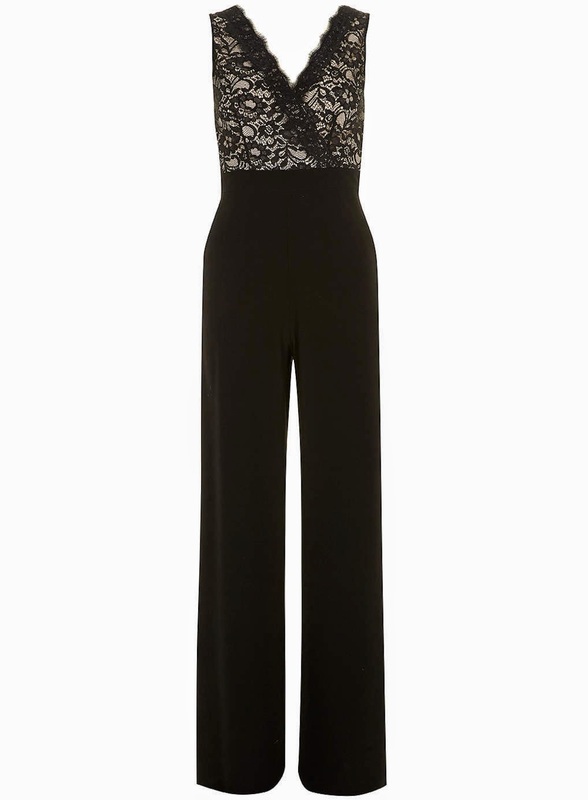 If you're a size 8 or 10, snap up this lovely lace jumpsuit for £42. They also have a daisy-print jumpsuit in sizes 8 to 22 for £38. 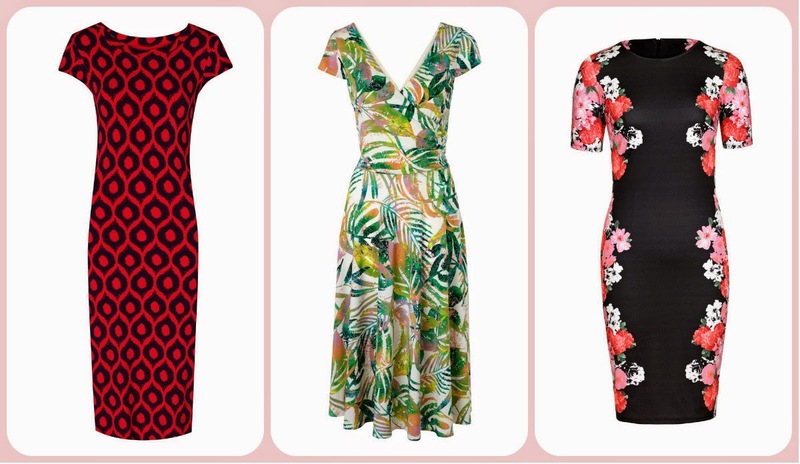 These three from Long Tall Sally are some of my hero frocks. The Ruby Rocks tube dress (£45) on the left saw me through work, a wedding rehearsal, dinner and calling an ambulance. It works HARD and it gets insane compliments. I've already waxed lyrical about that gorgeous jungle print dress in my post from LTS's bloggers breakfast, but it's worth repeating. STUNNING. And then there's the floral dress. OH HO. This scuba dress has been my lifesaver at parties. I flag it up to you now as it's £50 in the sale, with all sizes except 18 remaining. It fits beautifully and you can take it anywhere. I met Jilly Cooper in it at a Country Life party. JILLY COOPER! He looks pleased, don't you think? And this. This being my beautiful friend John and I getting papped (reader, I giggled), and the fact I forgot to bring an evening bag and had to use the bag I cram my Oyster card and make-up into. I am not sure if I pulled it off. Either way, this is a brilliant dress, the sleeves are a great length (I know it is pathetic, but I am not keen on my upper arms) and all generally jolly good. Go forth and try it on. I do not have a nice illustrative picture of me wearing this insanely excellent dress from Tall Girls, mostly because the full-length one I have was taken by my brother while I was having a nap on the sofa "resting my cankles" as he charmingly put it. Brothers. 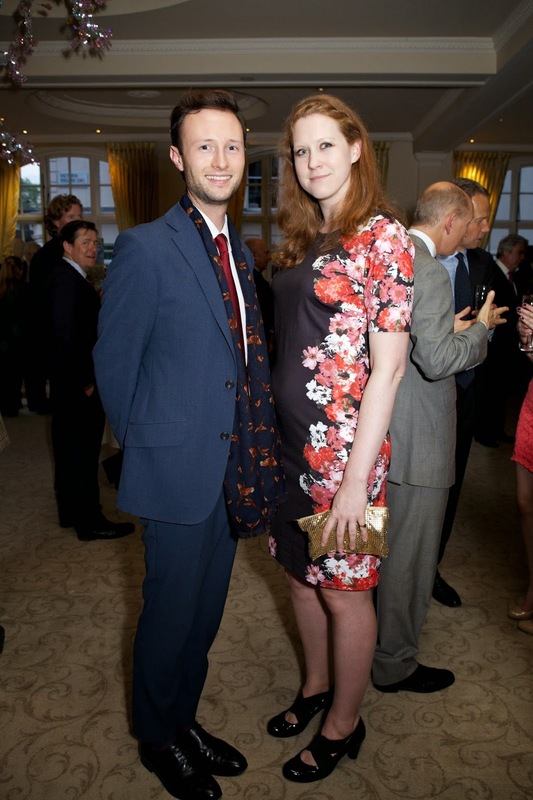 But trust me on this, it is a winner, an excellent frock that travels extremely well (jersey! So good) and looks wonderful wherever you take it. My mother approved of it. She is tricky to please. My boyfriend also approved of it. The perfect combination. It's £35 and also available in black and grey. There is also a lovely version with lace sleeves (£39) available in natural, black, grey and white. Probably avoid the last one if you're going to a wedding. I also love this purple midi dress for £35. Mmm. Good grief I love red. 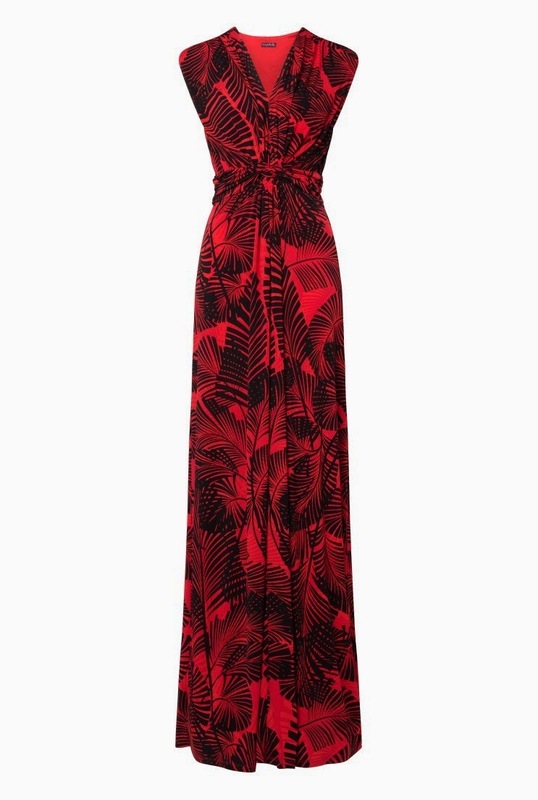 This red fern print maxi dress (£80) is new in, and if you get the LTS catalogue you'll be able to get a discount. This would look stunning on so many figures and colourings. Sigh. "Wait, what? This is way too casual." Yes, on the front of it, it is. Massively. But it's also a brilliant base for accessories, to make an impact without MAKING AN IMPACT. Chuck on a lovely necklace, some jewellery, a jacket and ideally a whopping great hat, and you're set. Oh and this? 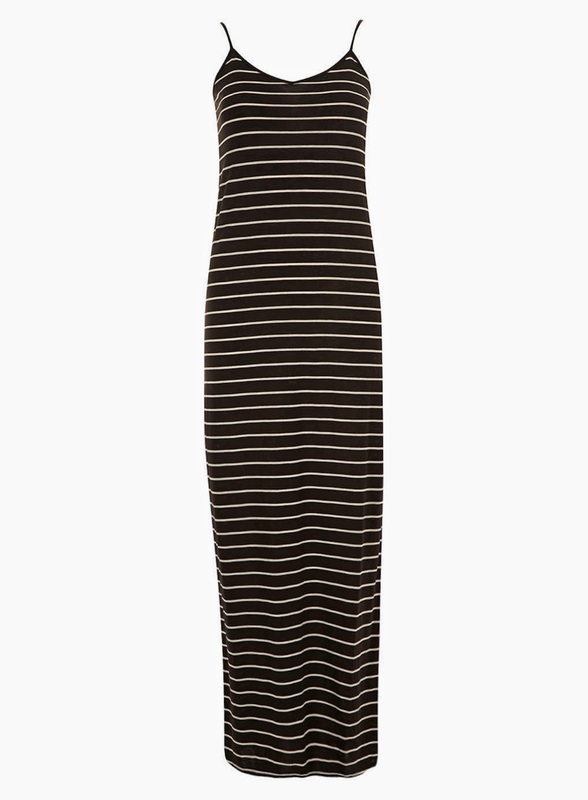 It's £18 from Dorothy Perkins and it also comes in red for £16. Love the ridic glamour of this lovely blue maxi from Little Mistress, one of ASOS's tall brands. It's £60 and if you're a size 14, it's your lucky day. 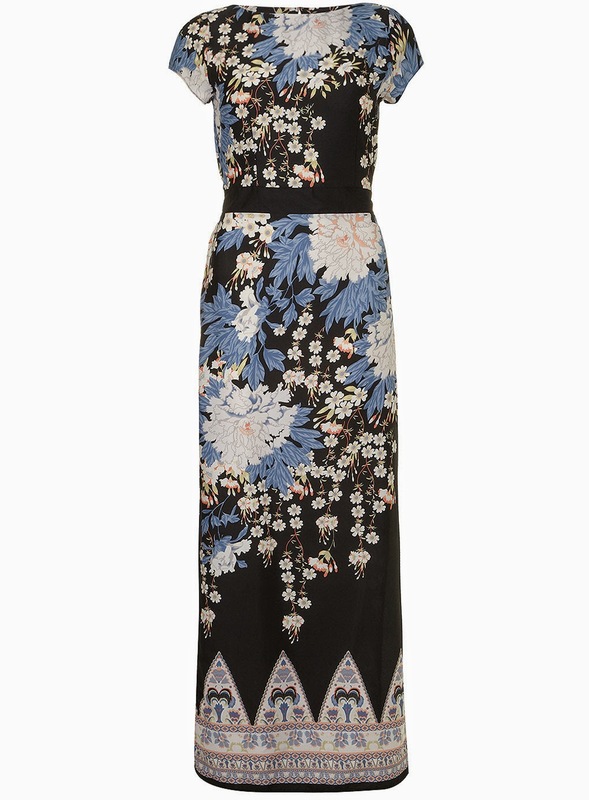 I nearly spat out my tea when I saw this stunning maxi from Dorothy Perkins - how gorgeous is it? Answer: a lot. 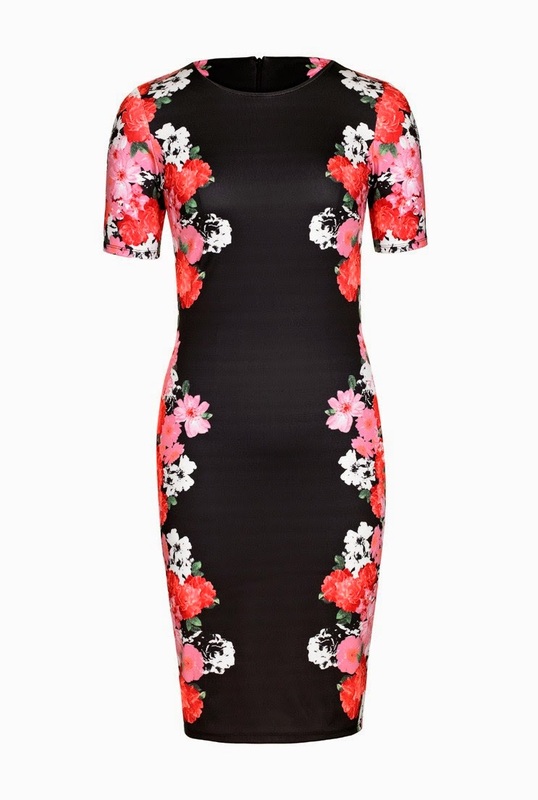 They have one left in a size 22 for £30. I realise this is wildly annoying but seriously - if you're a 22, get yourself a treat. And the rest of us can have a quiet think for underestimating them so much. If knee length or lower isn't for you, there a plenty of lovely things to wear without flashing your knickers. 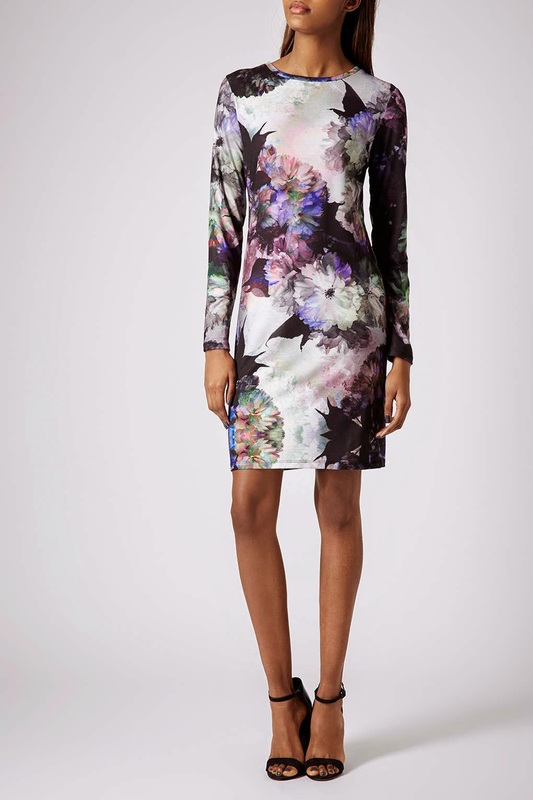 Like this digital print bodycon dress from Topshop, which is £32 and vv pretty. Anyone for tennis? This peplum shift dress has a V-neck at the back and is jaunty as you please. It's £30 from ASOS Tall (well done ASOS). Kat, I love the advanced collaging skills you are bringing to each post. This one - complete with mini Kats - is just charming! Agreed - you bring shame to my basic collage attempts. Oh, and the dresses are excellent too I guess, I'm just blinded by collage jealousy. Why thank you mesdames! It's purely out of keeping up with Kardashians (ie, Gemma). I've no idea how she makes hers look so pro. it's modern day decoupage. Yes, yes all very lovely. But I'm getting a little fed up of all the tall girl posts. We're not all ridiculously statuesque. Will there be something for petites soon (please)? Hey Tristan! I write my tall girls column once a fortnight for readers who, like me, have problems finding clothes. We can't all fit into the mainstream stuff we feature, so it's nice to have posts that are specifically tailored. Thanks :) I'll read through those again. I look forward to more petite stuff soon. Love the blog as a whole btw so I hope you're not too offended by the comment. The Friday edit is the highlight of my week. That's great to hear! Hope you find something good in today's. Tristan, I'm long overdue to do a petite girls post. Anything in particular you've been looking out for? I'd love to see some workwear, would be great to see some tailoring that doesn't need to be altered. Maybe light jackets or coats. And summer dresses. I'm 5ft2 so my main petite gripes are a lack of height and narrow shoulder issues. Oh - and possibly nice bras in 26/28/30 back sizes.